I acquired a copy of Butterick 9578 a few months ago, and was very excited when the Did you make that? Apronalong came along because it gave me a reason to try out this pattern instead of finishing all the projects I’d already started. I made my first apronalong apron using a free tutorial by Bari J. It was easy, fun, and very convenient because I caught a cold and discovered that the pockets are perfect for carting around tissues. And then I moved on to the apron I really wanted to make…version A from the same Butterick pattern. No, I’m not wearing the apron. I’m too cranky to want to be photographed in it; I’d just have a big scowl on my face. The tie belt is quite nicely done. It’s in two pieces; you sew the unfinished ends inside one of the pleats. The half apron has pleats on the outside; the full apron, which uses the same skirt pattern, calls for the fabric to be pleated on the inside instead of the outside. That makes sense because for the half apron the waistband covers the top half of the pleats, whereas with the full version the tie belt starts in the middle of each front half, and therefore wouldn’t accomplish the same thing. That’s a close up of the tie belt and its enclosing pleat. The pockets look very cute. I wasn’t sure if I’d like them because they were folded down for the half apron, but they turned out to be just right for this variant. You may be wondering what’s wrong… The bodice, of course…I always run into trouble with bodices. This apron is almost like a dress in that the bodice wraps around. Here’s a shot of the button in the back. Those are sparkles in the fabric – it’s a really fun print! The button isn’t very exciting. The apron really should have a hot pink button, but this was the best I could come up with since I wasn’t about to run out to purchase one button for a pattern that’s irritating me this much. I thought I’d be safe with the bodice because this is an apron, but apparently not. It bunches up in a weird way in the front, and in the back it’s poofy and doesn’t lie flat. I can fix this, but not in my current cranky state. So…technically the apron is done in time for the apronalong, but I won’t be wearing it until I can figure out how to correct these issues. I’m toying with the idea of changing the back to be more like the gingham apron I made in the summer, but that feels a bit drastic. Probably. On a positive note, I finally found the right fabric for my Peony dress! It’s Japanese cotton I found at Elfriede’s, the nicest fabric shop in Boulder. I bought a few other things, but was smart enough to restrict myself to buying fabric for only three patterns…nicest also means most expensive! I picked up a lovely floral print for the Sureau Sew-along (no, I haven’t learned my lesson…yay for sew-alongs!!! ), and two different wool crepes for a fantastic Simplicity pattern from 1942. I’ll undoubtedly be making several muslins for that dress. The very nice lady who was helping me clearly thought I was a beginner. I wanted to say: thank you, but I’m an advanced beginner! I was very polite when she explained what a muslin is, and didn’t even react (hopefully) when she told me that she makes her muslins out of $12/yard fabric because it’s less expensive. I’m making so many muslins these days that I can’t even keep up with the math to figure out what that would cost me! But she was very helpful, and while it did take three people to help me settle on the colors for the wool crepe dress, it was a lot of fun. And I can finally make my Peony! Of course, the sew-along for that pattern is over…but at least I’ve found a fabric that I love! I’ve been wanting to try out Butterick 9578 for a while, and the Did you make that? Apronalong gave me an excellent reason to make yet another apron in spite of the fact that I rarely cook. I blame my pose on my photographer, who gives me directions like “wave your hands around” or “look at the ceiling.” Most of my photographs are clearly pictures of me caught in the middle of telling him how ridiculous his instructions are. There’s no copyright on the pattern, but it’s probably from the late 1950′s. I’d been planning on making the full apron, but thanks to Karen’s apronalong and the convenient timing of a fabric sale, I decided to make both a half and a full apron. I started with the half apron so that I could experiment with the pattern. The apron has four sections of pleats; no gathers. The pleats are a really nice touch. The pockets are made by sewing squares of both fabrics together, then the top corner is turned down to display the contrasting fabric. The directions just say to fold the pocket down. I was planning on tacking it down, but they lie pretty flat. There are four pockets total, and they line up at the corners. The apron goes pretty far around, unlike the last apron I made. Here’s a side view so you can see about where the pockets stop. I really love how this turned out. Now I’m off to finish the full apron since the apronalong ends tomorrow!!! I’ve been pondering aprons since signing up for the Did you make that? Apronalong, and the question I kept coming back to was: why on earth would anyone ever bother with a half apron? A week or so I ago finally realized the reason: pockets!!! Obviously you can put pockets on anything, so while I’ve been strangely anti-pocket this year and didn’t put any on the apron I made in August (in spite of the fact that they would have provided an opportunity to use even more rick-rack), I do actually like pockets. Thanks to my epiphany, I now have a cute half apron complete with pockets! It’s a bit hard to tell from this photo, but there are actually two pockets on this apron. I sewed a seam down the middle to split the one wide pocket in half. I found this pattern from a list of links to free apron patterns that SachitaBean posted on Karen’s blog. The pattern is pretty straightforward, although if I make it again I will sew both sides to the ruffle at once. That might be a bad idea, so if you try this pattern make sure to use your own judgment. The apron ties seem a little long, but since I’ve only made one other apron I could be totally off base on this. I’m making another half apron so I’ll compare the ties when that one is done. One of the best things about this pattern was that it gave me an excuse to use two sewing machines at once on the same pattern! I generally have both set up for different projects, but on this one I used both yellow and pink thread, so it was perfect for the duo. So there! I say to my friends who’ve questioned my having two. I’m not answering to anyone who questions my having four…that’s a different topic entirely. And no, I have not even turned on the Rocketeers yet…they’re just so pretty that I can’t bring myself to actually use them. And not only does this apron have pockets, it has pockets on both sides because it’s reversible! I wasn’t sure how well that would work. I was a bit concerned that the inside pocket would make the apron too thick and maybe bunch up, but it turned out to lie quite nicely. I’m making at least one more apron for the apronalong – the one in progress is from a 1960s pattern. And, of course, it has pockets! 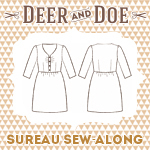 In the past week I’ve signed up for not one but two sew-alongs! I’m getting a little nervous about reading sewing blogs…who knows what else I might commit to??? The first is Sew Colette 2.0. I’ve been watching all of the lovely creations that have come out of this sew-along, as well as peeking at those from the previous sew-along, but I wasn’t planning on participating. I’m currently working on four sewing projects, with varying degrees of success, and that seemed to be quite enough. Then I saw Colette’s fall patterns and spent just a little too much time admiring the Peony dress. It’s not really my fault – I’m a sucker for polka dots. Not only have I signed up for Sew Colette 2.0, it seems only fair that I should catch up with everyone else and not sneak in late and start with the current pattern. This felt like quite a challenge when I thought I was only one dress behind, but it turns out I’m actually behind by two (Hazel and Macaron). Fortunately I took advantage of my enthusiasm before realizing the enormity of my undertaking, and went shopping! I’d been eyeing the Colette Sewing Handbook for months, but kept putting off purchasing it because I own plenty of other sewing books and couldn’t figure out how to justify yet another. Apparently all I had to do was think about buying it for the five patterns that come with it! It was a relief to finally come up with a rationalization that worked. Of course, the first time I opened the book it happened to be to the page on which Sarai talks about ‘the dark side of fashion,’ where fashion ‘can also fuel an almost endless desire to consume, to buy more things and to buy them less thoughtfully.’ Momentarily alarmed, I realized this of course did not apply to me because all of my purchases were related to things Sarai herself had created. Plus I’d thought about everything I’d bought for at least an entire day beforehand. I snuck in Jasmine and Anise because they’re so darn cute. I’ll make them if I survive the sew-along. Happy with my latest over-commitments, I bought some fabric that might or might not work for Hazel and Peony. And then I signed up for another sew-along! Now I just have to make three dresses, an apron, finish my novel, study Italian, and then there’s the day job. Something is clearly going to give, and your guess is as good as mine as to what!